India, as hard as it might be to believe has a cherry season...in some part of the country, and it is only in the very recent years that they made their appearance in cities across the country. They are grown in the State of Kashmir, as the tree grows better in altitude with mild Summers and Springs. And, the Kashmiri variety might not really look like your typical stereotyped cherry all dark red and plump but tastes really sweet despite its lighter reddish and yellowish tone. Cherries now being sold in big boxes in Mumbai, I decided to do a cherry pie while leafing through one of my old issues of Goodfood magazine. The recipe they had in a 2012 issue was however made with imported black cherries, covered in cherry jam and had a truck load of sugar in the almond paste used in the filling as well. Just reading the recipe made my mouth sticky, and my tummy turn...there is such a thing as too much sugar and over-sweetness. So I heavily modified the recipe, to give it the rustic Swiss type pie look, with far less sugar, less fancy schmancy cherries, no jam and guess what? The taste was so good it barely lasted half a day before we were all 3 of us done eating it. So here goes, I am sharing the recipe with you all. Start by crumbling the cold butter in the flour with your hand, rubbing the two ingredients together until you have a coarse wet sand texture. Add the sugar and egg if using and mix, then add a little of the cold water at a time until you have a soft dough (you should not end up using more than one or two table spoon of it in total). Wrap the dough in plastic wrap and put it in the fridge for half an hour. 140g ground almonds, 100g melted butter, 100g caster sugar, 2 eggs, a splash of kirsch or bitter almond essence. Enough fresh cherries to cover the pie. Preheat your oven to 180 degrees Celsius. Take the dough out of the fridge and roll out on a backing parchment sheet (very important, the dough is soft and sticky still, the parchment makes it easy to manipulate). Place the dough into a shallow pie dish (this recipe makes enough for a 10 inches diameter shallow pie dish). Place dry kidney beans on top of the dough after poking with a fork, the pie crust need to be blind baked, if you are familiar with the process and have done it before, you probably have a jar of already used kidney beans for that process. If you are doing it for the first time, it is a really simple thing, you just spread dry kidney beans on the dough and shove it into the oven, the beans only prevent the pie crust from bubbling while cooking with no filling. The pie need to blind bake for about 25 minutes or until it starts turning golden. DO NOT UNDER ANY CIRCUMSTANCE BYPASS THE BLIND BAKING PHASE. The filling of a cherry pie with almond paste is way too dense and moist and will prevent the bottom of the pie to bake at all if you do spread the filling on an uncooked crust. Once your pie crust is done, take it out of the oven and keep the oven heating. Remove the kidney beans and save them in a jar for another blind baking use. 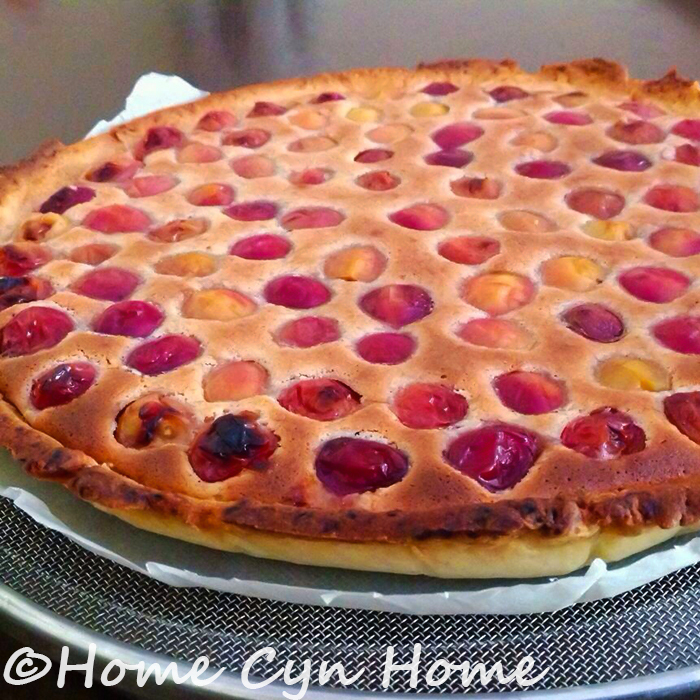 Spread the almond paste evenly at the bottom of your pie, and place the cherries on top. Bake for another 10-15 minutes, or until the almond paste starts turning golden brown. Take the pie out of the oven and let it cool completely on a wire rack before eating. If you have the patience, which I don't you can pit your cherries before using them to make the pie, but the process is time consuming and can be a bit messy. Personally I can totally live with spitting the pits while eating the pie, but to each their own. Almost looks like a clafoutis rather than a pie. When I lived in Berlin I was surprised that the Germans paired cinnamon with cherries in pies, tarts & yogurt. seemed a strange combination but it worked. Germans put cinnamon with strawberries too, I didn't care for that very much. The sweet Kashmiri yellow cherries with their reddish blush are called 'Royal Annes' in the US & are grown in the Pacific Northwest. I miss the sour cherries like Montmorency's. Geez, I'm spoiled being from California. It does indeed look like a clafoutis. Swiss usually put a layer of ground hazelnut at the bottom of fruit pies and then after arranging the fruits on it pour a mix of beaten egg and milk on top. Here I decided to follow the original recipe for an almond paste instead. Swiss do add cinnamon to strawberries too, and my grand ma used a little black pepper in a cut strawberry desert too. Both cinnamon and pepper bring out the natural sweetness of strawberries out so that you ca pretty much omit the sugar. We usually just put a bit of lemon juice or Gran Marnier (orange liqueur) on strawberries. It was fashionable to put balsamic vinegar on strawberries in the 90's in the US also. I need to make a pie for my Kashmiri family. I said something about pie a couple of days ago & my niece looked at me & said "What is PIE?" I think I'll wait til the weather cools down rather than risking a pie crust pastry meltdown. I went to the IKEA in Bangkok a few weeks ago. Was hoping to pick up some baking supplies like parchment paper, sliced almonds, pearl sugar etc. There were NO baking supplies! The only 'food' was in a huge freezer case. I guess the Thai don't bake but they do like frozen moose meat lasagna? WEIRD! Could it be that baking is not done much at all all over Asia? I've been to the IKEA in Singapore & they have baking stuff. Moose lasagna sounds good to me! you would join us on Mytaste.in so that we could link to your blog.